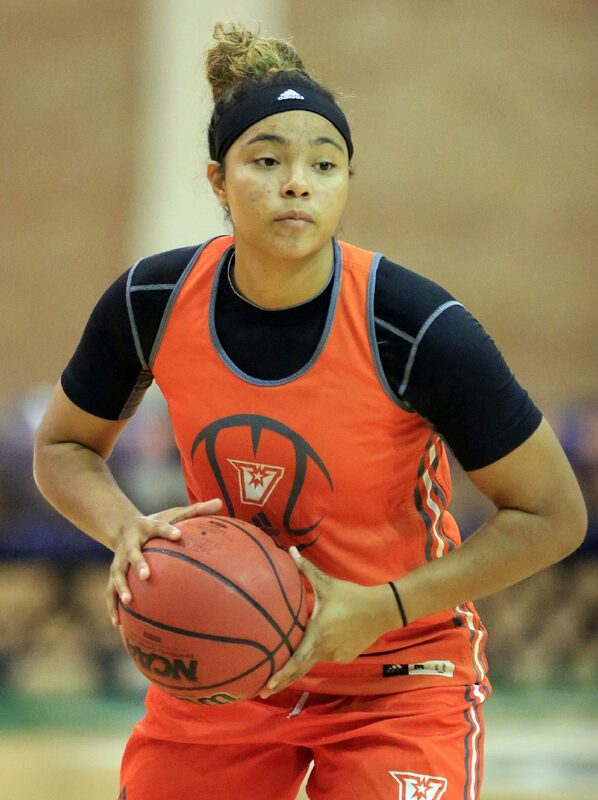 EDINBURG — Just a couple months before beginning her first basketball season at UTRGV, Quynne Huggins was quarantined in her room at her family’s home in Arizona. After weeks of suffering from fatigue and light-headedness, Huggins endured a period of rapid weight loss — from 155 pounds to 115 in just a few days. Doctors eventually discovered Huggins had early stage thyroid cancer. Desperate to take the court for UTRGV this season, Huggins opted for radioactive iodine treatment to essentially kill the thyroid. While less of a guarantee to succeed relative to having the thyroid surgically removed, the radioactive iodine treatment offered the potential for a much faster recovery time. Huggins remembers being at the hospital as the pill was administered to her from a metallic tube in something that resembled a pint-sized refrigerator. She quickly got in the back seat of her mother’s car and rushed home before the effects of the pill made it unsafe for anyone to be in her immediate proximity. University of Texas Rio Grande Valley's Quynne Huggins (11) drives to the basket against CSU Bakersfield's Alizé Lofton (21) in a WAC conference game at the UTRGV Fieldhouse Thursday, Jan 11, 2018, in Edinburg. Quynne Huggins during practice at the University of Texas Rio Grande Valley on Monday, November 13, 2017, in Edinburg. For about a week, her family left her meals on paper plates outside her bedroom door. After Huggins was finished eating, she placed the tray outside her room, and her mom donned latex gloves to put Huggins’ plate and cup into a plastic bag for safe disposal. A few weeks after the treatment began, Huggins was cleared to start taking hormone pills that help replace the functions of her thyroid. And just seven days later, she was driving down to UTRGV for the start of the fall semester of her junior year. 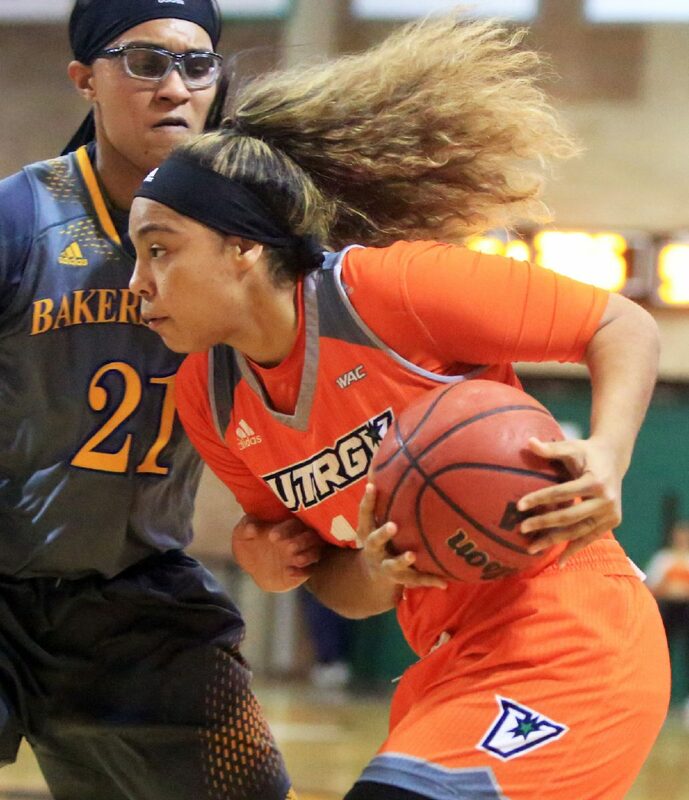 Though her return to full strength was often challenging, Huggins took the court for UTRGV on opening night and has played in all 29 of the team’s games. As UTRGV prepares to begin play in the WAC Tournament with a matchup against Bakersfield at 4:30 p.m. today, Huggins ranks as the team’s leading scorer with 10.1 points per game. Huggins first started to notice issues during the spring of 2017. She said she always felt hot and had bags under her eyes, and she was constantly hungry and tired. “I just looked like I hadn’t slept in forever,” Huggins said. She also noticed that her heart was persistently racing, and the problem only grew worse if she tried to work out. Showering exacerbated the issue, to the point where Huggins started fainting. Going forward, Valyncia would stay in the room while Quynne showered, catching her whenever she started to fall. Quynne also began to develop a lump on her thyroid — the most obvious sign of the root of the problem. During the period she was quarantined, Quynne remembers having an extremely dry mouth and eating a lot of sour candy to trigger her body to produce saliva. She said she spent much of the week watching Netflix, but she also worked to get ahead in school. She had classes to finish at Mesa Community College, where she played in 2016-17 after transferring from Utah Valley, and an additional two courses from Rio Salado College to knock out before she would be eligible to play at UTRGV. She said the extra time with nothing to do helped her finish her class work a week early, but the process was hardly easy. Quynne only left her room late at night, when she was confident her parents and brother were asleep. If she needed anything during the day, she texted them, and they left it in a bag outside her door. Her clothes and sheets had to be washed daily. As the radioactive iodine treatment began to take effect, Quynne went from being hyperthyroid to hypothyroid — a normal process doctors needed to see before they could begin to prescribe hormone pills to return Quynne to a regular level. Among other effects, the change meant Quynne started putting weight back on. She tried to ease her way back into home training with light biking, pushups and core workouts, even before her doctors had prescribed hormone medication. She also accepted an offer to scrimmage with her old high school team, but she quickly found that her heart rate was still above the normal range, and she grew light-headed not long after she started running. She was shocked and discouraged by how easily even the high school freshmen pushed her around on the court. Quynne struggled to muster enough strength to get the ball to the rim for free throws, much less 3-pointers, so she continued to work on her form shooting with a medicine ball. A couple weeks later, during her third doctor’s visit, Quynne was told she was finally ready to begin taking the hormone pills that would bring her back to standard levels. Quynne started showering again on her own without issues, and she ran through a practice with her high school team without any heart rate fluctuations or feelings that she was going to faint. Her treatment had already forced her to miss the Summer II semester at UTRGV, but she left home seven days after starting to take her hormone pills and arrived on campus a week before the fall semester began. Within 24 hours of moving in, she went through a workout with UTRGV assistant coach Anthony Anderson, who had been following Quynne’s progress through the summer as part of the team’s mentorship program. Anderson entered their initial session with the goal of gauging whether Quynne was physically capable of contributing to the team this season. First and foremost, he said he was happy to see she was excited about basketball again. He also found that Quynne didn’t want any sympathy. Whenever he asked how she was feeling, she told him she was fine. Quynne said she was only rarely short of breath, but her legs were shaking after every sprint because of the muscle she had lost. Quynne learned during the treatment process that her family has a history of hyperthyroid, and her new hormone medication has made putting on muscle easier than ever before. During the summer, she said her bicep was about the size of what her wrist is now. Today, she has the strongest bench press max on the team and is capable of holding her own in the post despite being undersized at 5-foot-11. A few weeks into UTRGV’s preseason practices, head coach Larry Tidwell met with the team to talk about the players who weren’t able to be a part of summer workouts. When he got to Quynne, he mentioned that she had faced adversity during the offseason, but he didn’t elaborate as to how. After the meeting, many of Quynne’s teammates asked her what Tidwell had been referencing, and she shared her story with them. Turk and Huggins regularly return to the UTRGV Fieldhouse on nights after practice for extra work on their 3-pointers. Quynne said she is also pressing herself to exceed the coaches’ expectations in the weight room — a major shift for a player who used to skip squats entirely. Quynne said she’ll be on daily hormone pills for the rest of her life, and she has blood work done monthly to ensure she’s taking the correct dosage. She said she felt her best around Christmas, then not as strong after doctors lowered her dosage following her next visit. Occasionally, she still has moments when she feels a certain basketball move she could have executed last year is beyond her grasp. Mentally, though, Quynne is stronger than ever, Valyncia said. After being released from Utah Valley for reasons she never fully understood and having to play at the JUCO level to avoid sitting out, Quynne was going to do everything in her power to get back to Division I action this season. Valyncia said Quynne has changed as a person as a result of the experience, better dealing with life’s problems. Quynne has a tattoo on her back that reads, “Sometimes you have to fall before you fly.” She lives by that motto.